@BrokeLivingJRB, @MariaHo, @fkassela play big hands, big pots on "Poker After Dark" this week. Pocket kings bring big rewards -- and big heartbreak -- on this week's "Poker After Dark" shows. This week PokerGO returned with more high-stakes cash game action from the ARIA Resort & Casino. 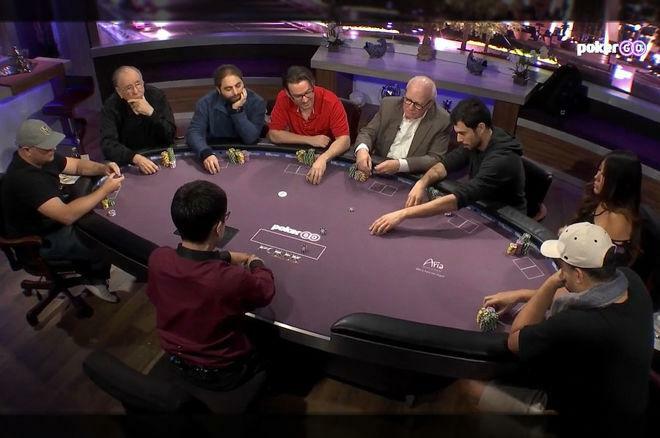 The new Poker After Dark episodes arrived under the heading "Reality Check" and featured a mix of familiar faces and some newcomers. The minimum buy-in was $30,000 (although most bought in for much more), with $100/$200 blinds and a $200 big blind ante. Schulman was the first night's star, kicking things off by winning a preflop all-in versus Dempsey on the night's very first hand. Schulman's held versus Dempsey's after they ran it twice, and the $102,000 pot went Schulman's way. Pocket kings featured in another interesting hand from early in that session, with Bellande the one being dealt cowboys. There had been a $400 straddle when Bob Bright opened for $1,500 from middle position and John Morgan called from the cutoff. It folded to Bellande in the big blind who three-bet to $5,000 with , and both Bright and Morgan called. The flop came , and when Bellande continued for $8,500 only Bright stuck around. Bellande bet again after the turn — $17,000 or just over half the pot — and after sitting quietly for a while Bright raised to $45,000, leaving himself just about that much behind. Bellande would call that raise with his overpair and flush draw, then after the river Bellande checked and faced an all-in for the rest of Bright's stack. Frank Kassela would join the action on Friday and in fact he'd also start the night with a quick double-up with pocket kings versus Bellande's ace-queen. Later Kassela would find himself involved in what turned out to be one of the more memorable hands of the night against Maria Ho. That one began with three players seeing a flop. Those cards missed Bellande's , but squarely hit the other two players as Ho made a set with and Kassela a straight with . Archived versions of both nights of "Reality Check" can be viewed on demand with a subscription over at PokerGO.